Perfect Automation 2.5.1 was released. Perfect Automation 2.5.0 was released. Eonza.org - create your own information storage. Free open source project. Perfect Automation provides the best choice in work automation and great time saving features. This software will help you to increase your productivity, save you time and money. You can use Perfect Automation as a launcher, a scheduler, a mouse & keyboard recorder and a powerful script editor. You do not need to install and use four different applications. All modules are combined into one single program. You will have just one icon in the system tray or the task bar even if you use all components! helps to automate any kind of task. creates stand-alone executable files with no external .dll files. has hundreds of visual commands and built-in general purpose functions. allows anybody to add own visual commands. Source code of the commands are available. for beginners: No programming required! for advanced users: supports a high level free open-source Gentee programming language. 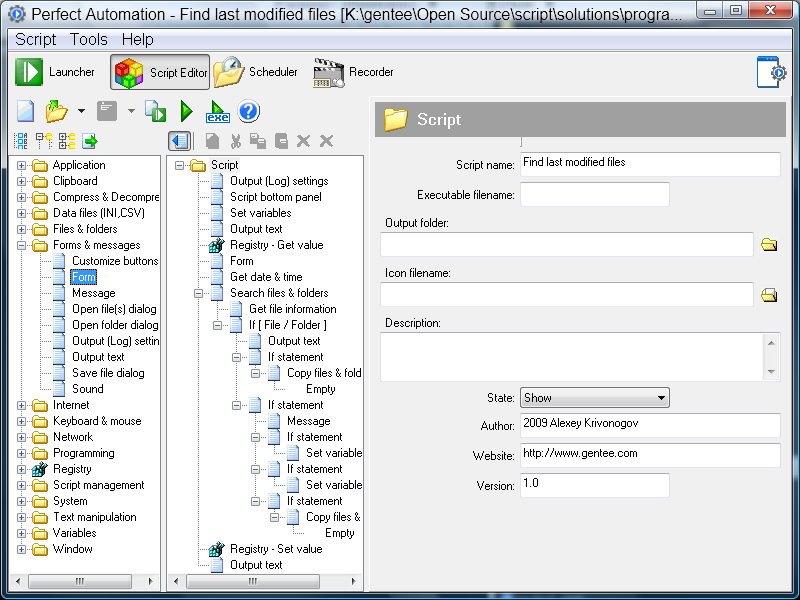 can create executable files and project files for Script Editor. creates macro files that can be played independently or used in any task of Script Editor. can remember active windows and activate them during the playback. is an easy-to-use shortcut manager. can launch all kinds of files, web-sites, documents and programs. allows you to run programs from the system tray menu, hotkeys or keywords. supports an unlimited amount of user defined subfolders and items. starts other programs and tasks periodically and at predefined times. integrates with Launcher. It is enough to specify schedule settings of the according items in the launcher. runs a task from hotkeys and has several kinds of triggers. Operating systems: 2000/XP/2003/Vista and Windows 7. Copyright © 2007-2019 Gentee, Inc. All rights reserved.